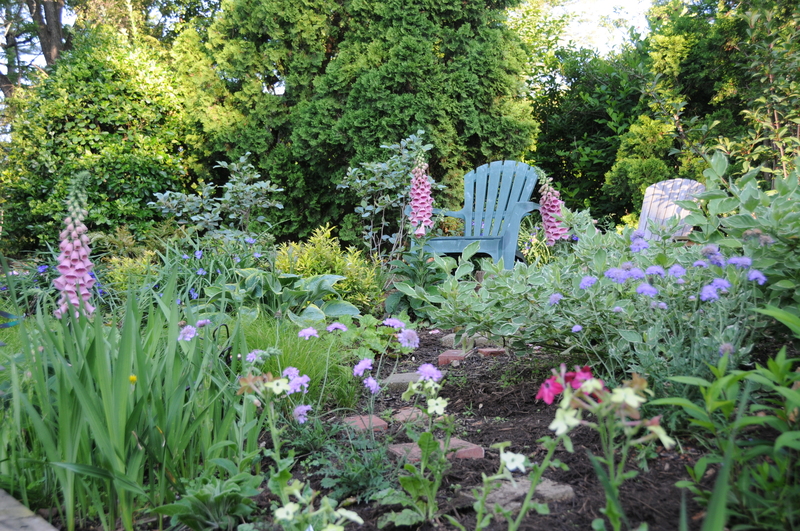 My husband and I moved into our house in Burke, VA (Zone 7a) early in 2003 and immediately got to work on “letting the yard go” for about, oh, 4 years or so. I’m sure the neighborhood was horrified by our neglect, as I know you will be when you see the “before” pictures. 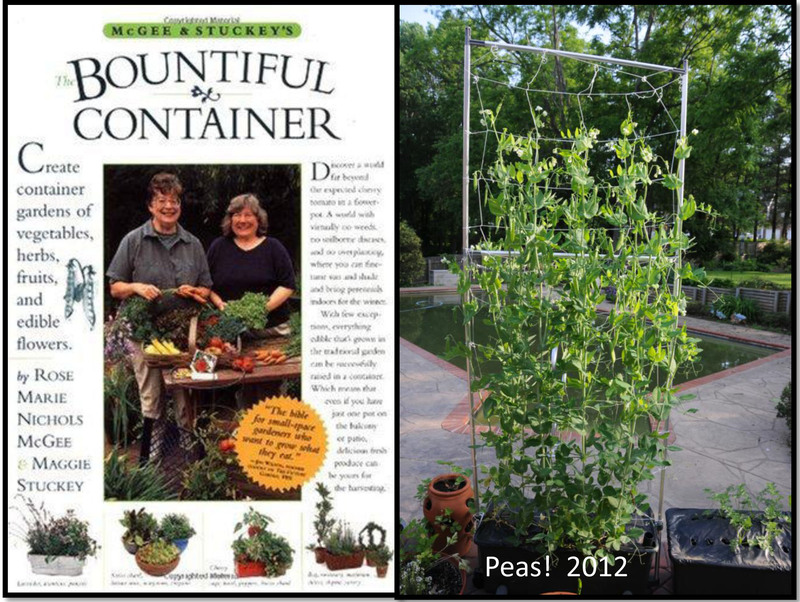 2007 was a pivotal year — the year I became a gardener! 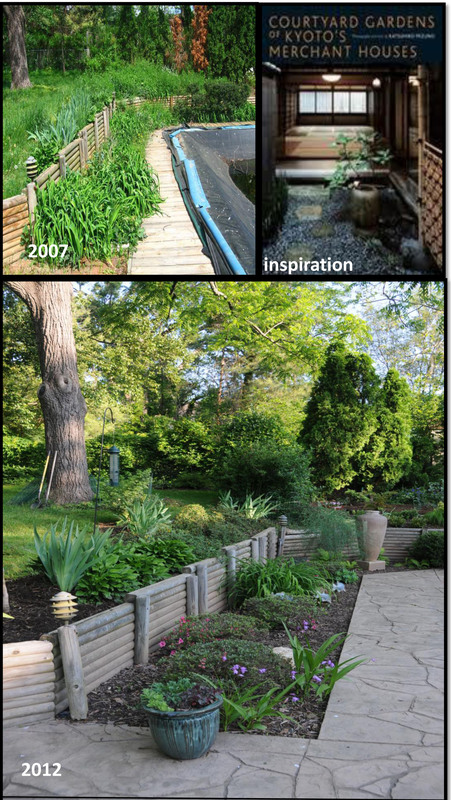 — and I’m glad I documented the yard that year so that, when I’m feeling horticulturally disillusioned, I can remind myself of the progress I’ve made. We’ve had a couple of large trees removed, and quite a bit of old decking replaced, but otherwise I have done every lick of work in the yard by myself, with manual tools! The above bed has been the stage for my most concentrated efforts. My Big Ideas. In 2009, fueled by Piet Oudolf’s Designing With Plants and a terrible case of hort- hubris, I attempted a mini-meadow in this location, with grasses and salvias and coreopsis. Epic fail! Too small an area and just not enough sun…the poor plants leaned and contorted themselves to get the rays they craved, and the stems wound up nearly parallel to the ground. Much better! I’m SUPER enthused about the Carex pensylvanica, which is spilling cooperatively over my ugly retaining wall. I love its fine texture. I want to comb it and braid it. The next collage shows my backyard as you enter it from the gate. 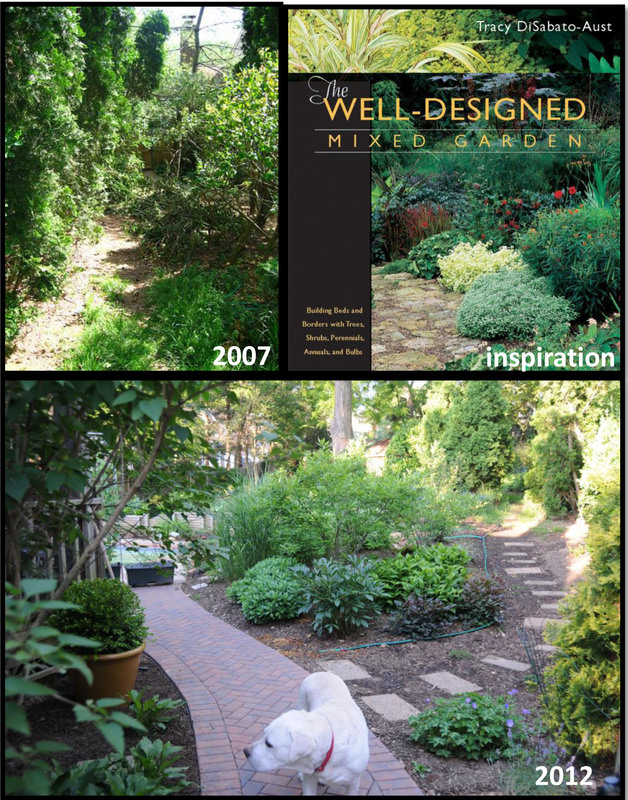 I love Tracy DiSabato-Aust’s new Well-Designed Mixed Garden, and I would say that the “Mixed Garden” idea is definitely the principle I follow in most of my backyard. Plants here include the always useful Boxwood in a Pot (‘Winter Gem’), Sedum ‘Autumn Joy’, maidengrass, peony, toad lily, Astilbe ‘Delft Lace’, Geranium ‘Rozanne’ and ‘Biokovo’, Ilex verticillata ‘Winter Red’, Thuja ‘Yellow Ribbon’. I’m attempting some creeping thymes and sedums around those stepping stones. And I just planted a new rose (the climber ‘Golden Showers’) behind that Yellow Ribbon Arb. Next stop, the Poolside Strip. Don’t look at the 2007 pic for too long or you may blow out your corneas. When I re-did this bed a few years ago, I decided to go for a tidy, more minimal look inspired by the courtyard gardens of Kyoto. So I planted five ‘Macrantha’ azaleas down next to the pool, and I try to keep them pruned in neat low lozenges. I kept a patch of yellow daylilies as well, and sometimes I stick low-key annuals in there, too. The little purply bletillas with the strappy leaves in the foreground aren’t really supposed to be there. Those were an impulse buy and I’m still figuring out where to move them. Next is my side yard, which faces southeast and is extremely dry. It’s not stellar looking, but I am very happy with the performance of the plants I’ve got in there and how they’ve thrived in terrible soil. The low shrubs to the left are Rhus aromatica ‘Gro-Lo’. The purple shrub in the corner is Physocarpus opulifolius ‘Summer Wine’. The pic really doesn’t do that shrub justice. I’ve all but ignored it since planting it two years ago and it blooms heavily and stays robust in very dry part shade. The Sedum ‘Angelina’ groundcover has been a fantastic spreader, though I’m not in love with the neon yellow color. The dark green shrub is Euonymus ‘Greenspire’ which I have moved about three times and it hasn’t missed a beat, loves it everywhere. Also in this area are all the flunk-outs from the ex-Piet Oudolf Garden, since there is more sun here. I’m still working on how to run a path through here…the wooden rounds were cut from the Ash tree in the 2010 pic (which fell over in a storm that same year) and I’d hoped they would look quaint but instead they look kinda ‘woodland ghetto’. Next, my attempt at vegetables. The only full sun I get is on my deck, so I have to grow vegetables in containers. The veg growing is definitely not my strong suit, but last year I read The Bountiful Container and I got all jazzed about growing food in pots. Probably more helpful was the fact that I invested in two Earthboxes this year. They’ve helped me grow veggies with very little effort. They can be pricey, so next year I might try to build my own from these instructions. Once I pruned away the protruding branches of my neighbor’s Chinese Arborvitae and then installed flimsy reed fencing, I found that this area actually gets a decent amount of sunlight. So I dug out some peonies from the front yard that were too shaded and planted them here. (The white blob on the ground is fallen peony petals, which the Japanese would find very moving.) Also, I planted my very first rose here, a hybrid rugosa (whatever that means) named ‘Therese Bugnet’. 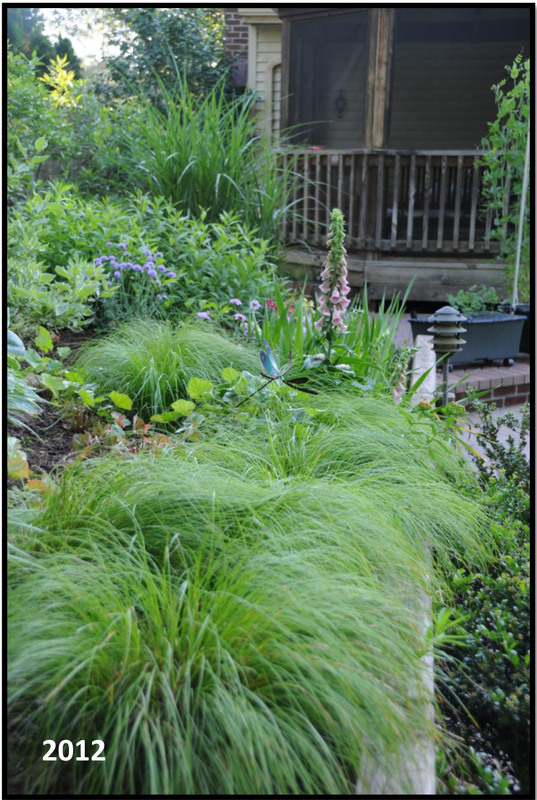 I’m not sure what else I want to plant here, but I like the idea of planting some of the same things my grandfather grew – showy summer bloomers. My eventual goal is for the visitor to have an “enchanting” experience while ambling down this walkway toward my budget-savvy stockade fence (concept: “Go away”). Ever since reading Heirloom Gardening of the South a couple of months ago, I have been obsessed with old-fashioned Southern plants that sport giant, fragrant blossoms. It’s weird, because this was sooooo not my thing….I was a foliage and massing girl all the way! But it just goes to show you the power of a good gardening book, as well as the fleeting nature of my tastes. 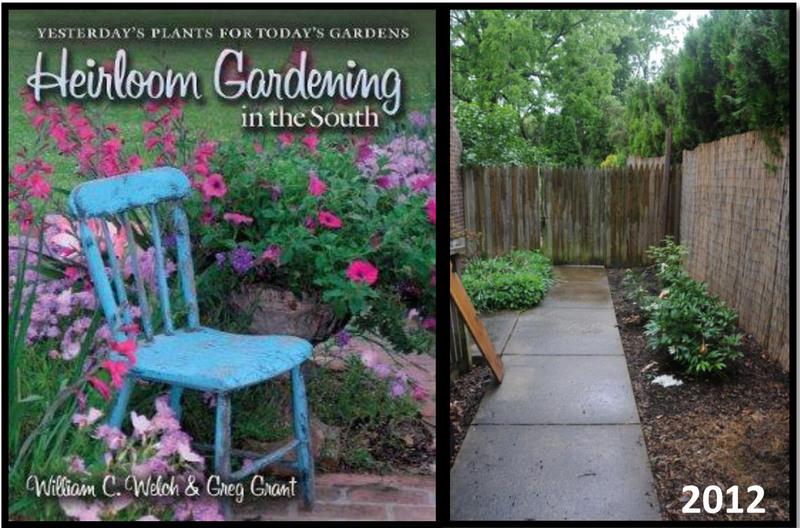 This book convinced me that I, too, can grow lilies and roses and jasmine, and that their fragrance will carry me back to my childhood summers spent drinking iced tea on Grandmother’s porch in Jackson. Never mind that my grandparents actually lived in Detroit and had no concept of iced tea, or that I’ve never been south of Atlanta. When it comes to gardening, I am totally fine with suspending reality. Wonderful, Jen. I’m so glad you found me. 🙂 Happy gardening! Hey there- why “from your walnut trees”? I have a black walnut growing in the back yard- thx to my lazy composting- too close for comfort to my house, patio and bamboo grove. I am nearly ready to concede but a tree-hugger at heart. Biggest fear is that it will hang over the house, patio and bamboo grove eventually. Went from about 20 nuts last year to over 100 this year and I have not even bothered burlap bagging them to crush with my truck. Someone plz tell me to “love it and harvest nuts forever”, as I watch her gradually take over any sunny bits, or warn me she will eventually land on my home and crack up my concrete patio. I have lots of Japanese maples and a beautiful curly filbert which I do not wish to lose. Truly torn. Also a bit too handicapped to fuss over growing harvests. Advise ASAP. All I can say is, if my walnuts were actually growing over my house, I would probably remove them. Eventually hundreds of nuts will be falling on your house, clogging your gutters, staining your patio, etc. the catkins in spring are pretty messy, too. Supposedly the wood is valuable, so you might check into that before getting it cut down. Good luck! Hi Mary, I too live in burke and have been landscaping in the area since the mid eighties. I like the way you think as far as using what is working for you already but we all know that we gardeners are never satisfied and that a garden is never done. 🙂 we have a tendency to push the envelope a bit and try things that may work whether it is because we like this plant or have a preconceived idea of what the space could be. We tinker. I love to tinker in my yard or in friends yards. I work fairly often here in Burke, and love to get to see someone’s yard for the first time and try to sleuth out their intentions or “What happened here?” I really like your new stone wall by the way. The pics look very nice. 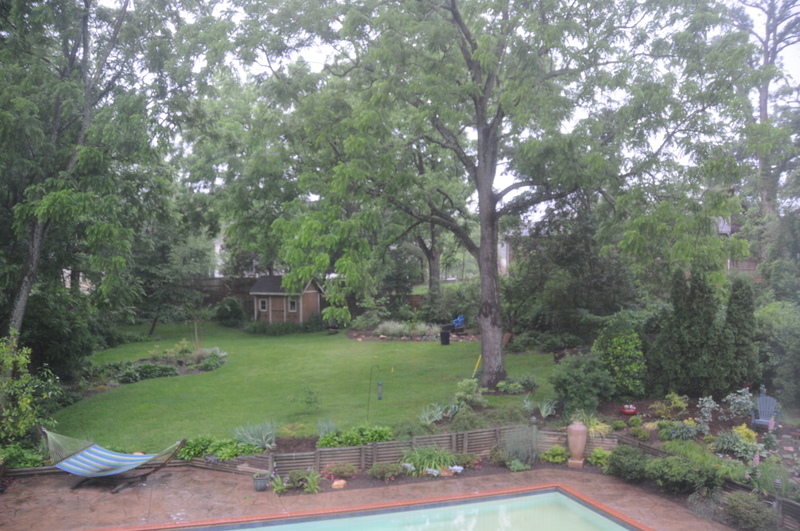 I grew up in McLean with two black walnuts in the yard. The swing set was under the trees. Hard hat area! Lots of memories from reading your blog here and look forward to more. Liked the aromatherapy entry, love smells in the garden. web site; this blog carries remarkable and truly good stuff in support of visitors.